EVEN in rich countries childbirth is not a tidy affair. On an earthen floor in a dimly lit home in Bangladesh it can be a killer. Bangladesh has nevertheless reduced maternal deaths during childbirth by 40%, from 322 per 100,000 births to 194, during the first decade of this century. It has done so in several ways: by encouraging women to give birth in hospitals and clinics; by giving better training to the women who act as informal midwives for those who give birth at home; and by improving obstetric treatment when things go wrong. When exactly things are going wrong, though, is not always obvious. In particular, the blood of a healthy birth can be hard to distinguish from the blood of a life-threatening haemorrhage. 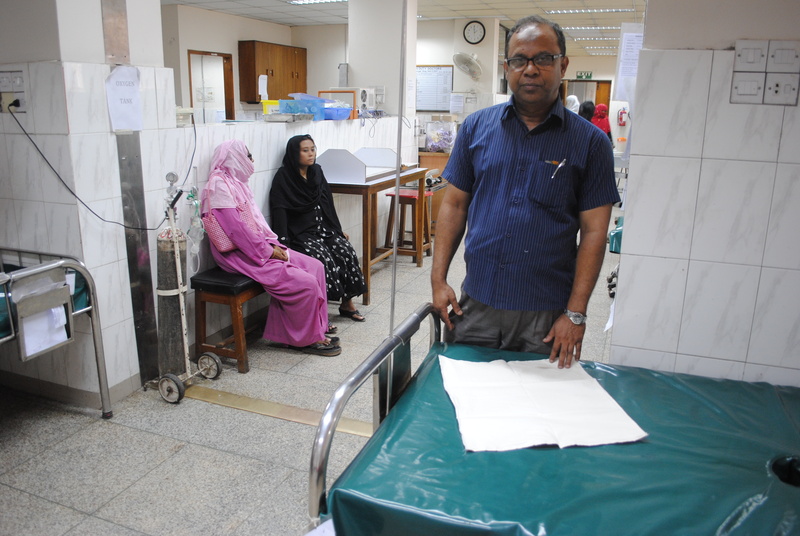 An invention by Mohammad Abdul Quaiyum of the International Centre for Diarrhoeal Disease Research in Dhaka should help to change that by providing a simple indication of whether a woman who has just given birth is in danger of bleeding to death. This invention is a standardised birth mat. Bangladeshi women often give birth on improvised mats, such as old saris. That gives them some comfort and hygienic protection, and also soaks up the blood of birth. Dr Quaiyum’s insight was that a standardised mat could distinguish, in a way obvious to those not medically trained (ie, most of those informal midwives), the natural blood loss of birth from that associated with a haemorrhage. Losing more than half a litre of blood after childbirth is a sign of trouble. Dr Quaiyum’s mat, a 50cm square made of cotton and tissue paper, is therefore designed to absorb just over 400 millilitres. If it gets saturated, the midwife should seek medical help for the mother immediately. To test the mat’s effectiveness the researchers collaborated with the Rangpur Dinajpur Rural Service (RDRS), a charity that distributes birthing kits to expectant women. They added the mat to these kits, which already contain thread to tie off the umbilical cord, a sterile razor blade to sever it, cotton gauze to clean the newborn, a plastic sheet for the mother to deliver on, and soap. They also added a dose of misoprostol, a drug that controls haemorrhages by causing the uterus to contract. RDRS distributed 77,000 of the upgraded kits, and Dr Quaiyum’s team subsequently interviewed 3,000 of the women who had used them, to gauge their opinions. More than 97% said the mat had been beneficial and that they would be willing to pay for one during future deliveries (the cost would be 40 taka, or about 50 cents). It saved lives, too. Of those 77,000 new mothers, 37 fewer than expected died.